Airtrackers Hot Air Balloon Safaris flies over the game rich Pilanesberg National Park which is located about 1hr45 north west of Johannesburg. The well known and popular Sun City holiday destination is on the boundry of the Pilanesberg National Park. The Pilanesberg National Park started in 1979 and offers the closest, best natural game viewing experience to Johannesburg. It supports the majority of naturally occurring South African mammals, including the Big 5 (lion, elephant, rhino, buffalo, leopard), as well as a host of bird species. The park covers 55000 hectares of bushveld, hills and holds in its boundries a 1200 000 000 year old volcanoe. 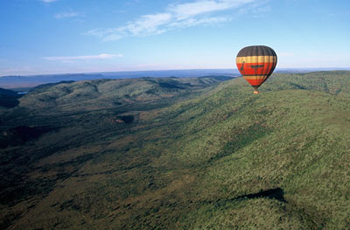 It is in the Pilanesberg Game Reserve that the Hot Air Balloon Safaris operate. The operation has been going since 1989 and the main pilots have clocked over 7500 hours between them. This hot air balloon safari operation boasts an enviable safety record, having flown approximately 80000 passengers without a single accident. The Hot Air Balloon Safaris are every day in the early mornings with only the weather and number of passengers deciding when hot air balloon flights do not take place. 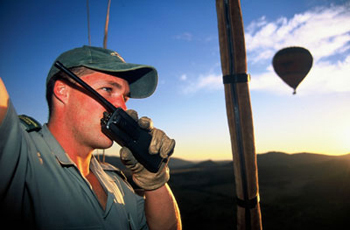 Passengers are collected from hotel or lodge (this can be any of the Sun City hotels, or Pilanesberg lodges) and taken on a short game drive safari to the launch site within the Pilanesberg National Park. The hot air balloon flight lasts approximately one hour and upon landing sparkling wine is served, something of a tradition in hot air ballooning circles. After being trailed by a vehicle whilst in flight, you will land in the bush and the vehicle will come and recover the passengers. A further game drive safari is then taken through the Pilanesberg National Park to a private game lodge where guests enjoy breakfast and get to share the exciting mornings adventure. After breakfast the guests are transferred back to their respective lodges & hotels. The whole morning’s exercise lasts about 4 hours. * A minimum number of passengers is required to confirm a flight. 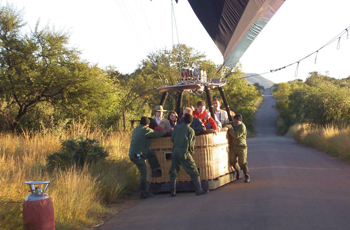 Hot air balloon flights over Pilanesberg Game Reserve are popular, so booking is essential.